The rivière – one of the most popular and enduring styles of necklace to come out of the Georgian period – features an endless line of matched or subtly graduated gems set within inconspicuous collets. Eighteenth and 19th century examples in amethyst or garnet are relatively common. Much scarcer are examples in topaz, such as this one sold by Bristol Auction Rooms (20% buyer’s premium) in Brislington on December 18. 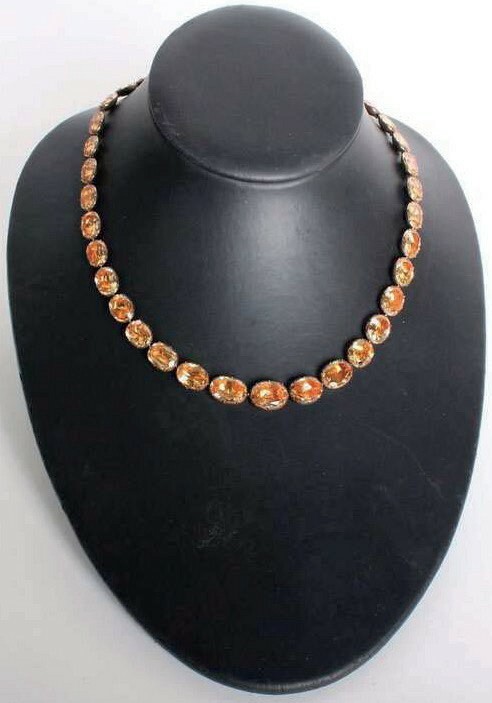 Dating to c.1820, but in a later fitted case for Bromet, 55 Burlington Arcade London W1, it comprised 38 oval free-cut golden topaz stones in foiled crimped gold mounts. The hammer price was a multi-estimate £8600. 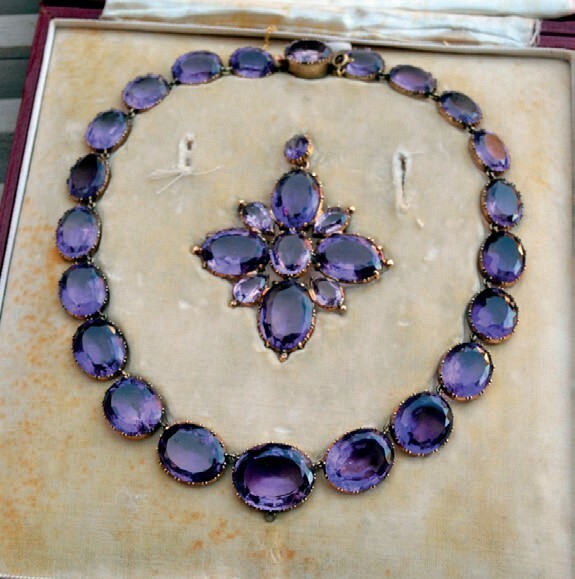 The fine Victorian 22-stone amethyst rivière necklace with pendant cross sold by Lawrences (22% buyer’s premium) of Bletchingley, Surrey on December 4, was by Garrard. With all elements in remarkably good condition, the auction house concluded it had spent most of its life in its original red tooled leather case. The 10-stone pendant came with a brooch attachment. Estimated at £2000-3000, it took a substantial £6000. The focus of the Barbara Holliday sale at Sworders (23% buyer’s premium) in Stansted Mountfitchet on January 15 was a cache of works by artists from the Modern British canon. However, the Cumbrian farmer’s wife also owned a substantial jewellery box, including an 18th century two-row garnet rivière with a cruciform pendant which sold at £3200.